There was this one time that Mummy took me into a charity shop. I think she was hoping that she would find vintage clothes in there. Mummy likes vintage clothes, even though they are old and smelly. Personally I prefer not to wear clothes at all, but for some reason Mummy seems to like them. Anyway, she’s always looking at clothes. Not just old, smelly ones, but piles and piles of jeans that all look the same, and really long dresses that are never going to fit her and probably belong to giant. We went into this shop and I SAW IT I SAW IT I SAW IT. It was a mighty fire engine, the like of which I had never seen. It was like my other fire engine, but ABOUT A HUNDRED MILLION TIMES BIGGER. I WANT IT I WANT IT I WANT IT. No Mummy, don’t make me leave this shop! Suddenly, we were outside, and Mummy was asking if I was all right, and I was like, “WANT FIRE ENGINE,” but in baby language and silly Mummy couldn’t understand. WHY DO THESE PARENTS NEVER LISTEN? I pointed with my best pointy finger, and I pointed and pointed and cried and cried, and Mummy took me back in, and FINALLY she saw it. She really is blind as bat. How could she not see fire engine, in all its fiery magnificence, when everything else in shop is just boring old clothes? Mummy bought fire engine for me, and I carried it all the way home on my lap, although mean Mummy wouldn’t let me throw it in the road. She said cars hit it or something, and fire engine break and no have fire engine anymore, so she put it under the pushchair and I couldn’t reach it. Mummy bad. Thomas has lots of Friends who Mummy doesn’t like because none of them are girls. Well, a few of them are but most are boys and apparently that’s sexist? I don’t know. Anyway, Mummy says the Isle of Sodor, where Thomas lives, is like a fascist dictatorship ruled by a Fat Controller with two henchmen. I’m not sure what that is, but I like Thomas. He has happy face. There are some books with him in so I think he’s sort of famous or something. And he has a Friend called Gordon who’s a bit grumpy, but my favourite one is the bus I saw parked in the background of one of the pages in Thomas book. I told Mummy over and over again that I WANTED IT and I pointed and pointed, but silly Mummy doesn’t understand my language and I think she thought I was weird, and thought about calling a doctor, but actually I just thought it looked a bit like the one we were on the other day which is called the number something or other, and has seats that you can stand on. I looked out of the window and I saw some other ones go past too, and I shouted at them. Mummy didn’t understand. I told Mummy I liked Thomas more, but she says who’s Thomas More and isn’t that someone from the sixteenth century who got burnt at the stake or something, and I’m like, what? Mummy likes Chuggington because he’s off the TV and she likes the TV. She’s always watching and singing The Time Has Come to Say Goodnight, even though it isn’t because I’m not going to bed for another two hours AT LEAST. Anyway, Chuggington is from this programme with a mayor who’s female and black, both of which Mummy approves of, unlike Thomas with his Fat Controller. I have no idea what she’s talking about. Chuggington is not black, he’s blue I think? Piglet not good with colours. So is Thomas so I don’t know what the difference is, but Mummy wants to put him second and not third, so I throw Chuggington behind the sofa and then she won’t know that I like Thomas more. This is my favourite today. Mummy says I can have this one first because is book and Mummy approves of books. Books are like TV I think, except they don’t sing, except one I got for Christmas which does cheer every time you poo in the potty. I get cheer when I point to my head as Mummy seems to think I am silly who doesn’t know where own head is, and acts all surprised when I correctly identify head. I don’t poo in the potty because what’s the point when you have book with boy who does and you can listen to his cheer? Anyway, potty book is OK but not as good as tractor book, because TRACTORS. Mummy says tractor book is from the library, so no throw it in the bath. Bad times. So now you know, these are my favourite toys. Tomorrow maybe I change head. Depends if Mummy takes me to the charity shop and I see BIG BIG TRACTOR. Next Post So, you want to be a writer? I know-looks like for all my encouragement of gender neutral toys, he has some very definite ideas of his own about what he likes. Oops, I think that might have been me! Haha! We had that EXACT situation, and I have to admit I did think everyone must have been thinking exactly that as I pushed him in the buggy with that behemoth precariously perched in his lap. Piglet loves fire engines. Cars and trains are pretty much all he plays with. Thanks for commenting! Ours has always been toys with big eyes…. anywhere we go we see them… my daughter is now 10 and still wants them!! She has to save her pocket money now!!! How funny! It’s fascinating what they are interested in. Ha ha! This is brilliant. Love it. 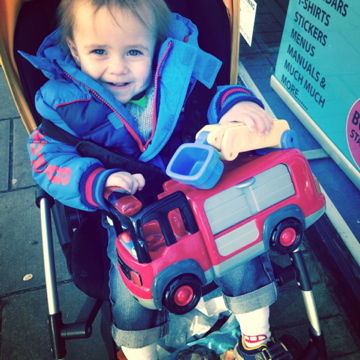 He looks so happy with his fire engine. My boy loves *any* kind of vehicle too. Thomas being set in a fascist dictatorship actually made me spit out my tea. ? Thank you! He was very happy with it-until I relegated it to the shopping basket under the pushchair because he was trying to throw it into the path of oncoming vehicles. I wrote an entire post about Thomas and his dubious Friends a while back. That’s a bizarre set up they’ve got there on the Isle of Sodor. LOVE! My mother is forever going on about how Piglet is a “typical boy” and I am not convinced that his interests are determined by his gender, so pleased to hear that you had similar ones! It was. Eventually I had to confiscate it to stop him from throwing it in the road! I know! To be honest he throws stuff everywhere. His new nemesis is the television. Eek! He does-in fact he won’t play with anything that isn’t some sort of vehicle. And I was so determined to prove everyone wrong about gender stereotyping by producing a boy who loves glittery unicorns, but looks like it’s not to be. Oh well! Thanks for hosting. Piglet is also crazy about buses. I find it quite bizarre! Ahhh I love this list Piglet!! It’s a very similar list to my boys who also LOVE fire engines, Thomas and Chuggington! We also have a huge fire engine that makes lots of noise when you press the buttons. For our tot it’s anything dinosaur based and, randomly a duplo horse he’s gotten very attached to. So funny how they all have their particular thing, even at such a young age. Piglet is interested in real animals, but not animal toys. It’s vehicles all the way for him. You really know how to capture the truth in parenting!! Thank you, that’s a lovely thing to say. I think Piglet may be required for a few more guest posts in the near future….Thanks for commenting! Haha, always the way! I think it must be because they are so red and bright!